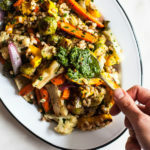 Usually at this time of year, as the temperatures warm up, my salads become progressively lighter and more colorful, vegetable-centric rather than grain-centric (which is the winter norm). This hasn’t been the case lately. 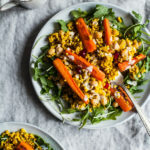 Whether because of springtime rain and little bursts of chilly weather—or simply because it’s what I’m craving—I’ve continued to make a lot of hearty grain and legume salads, with vegetables and herbs serving as seasoning rather than the main event. I’m sure this will shift around when summer arrives in earnest, but for now, I continue to love the heft and substance of these easy meals. 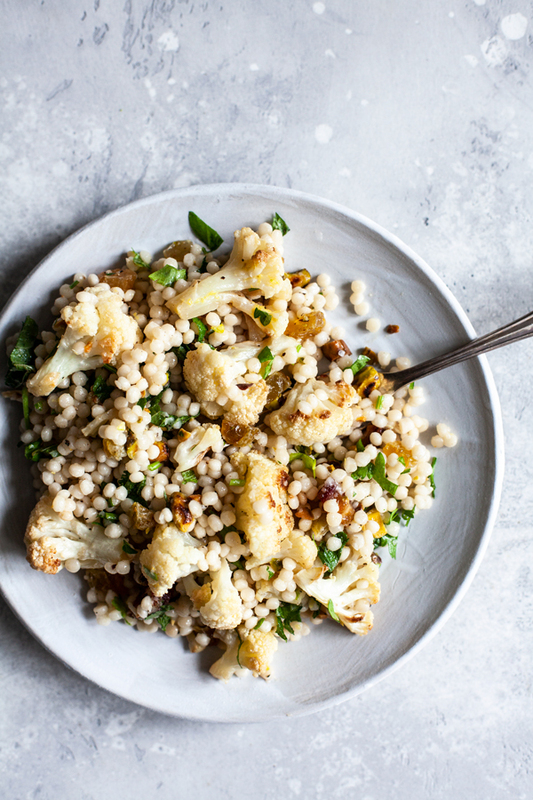 This pistachio date Israeli couscous salad with roasted cauliflower & herbs is my latest favorite, a sweet and savory mix of texture and taste. 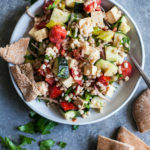 It was love at first bite when I first tasted Israeli couscous. I’d always enjoyed regular couscous, but I couldn’t get over how much more satisfying and toothsome this variety of teeny tiny pasta was. 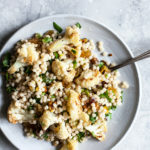 I don’t rely on Israeli couscous the way I do quinoa, barley, farro, or rice, but I do pick it up whenever I see it, reminded of how versatile and fun it is. 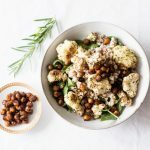 This particular salad is all about texture: the chewy grain, crisp-tender roasted cauliflower, and crunchy pistachios. 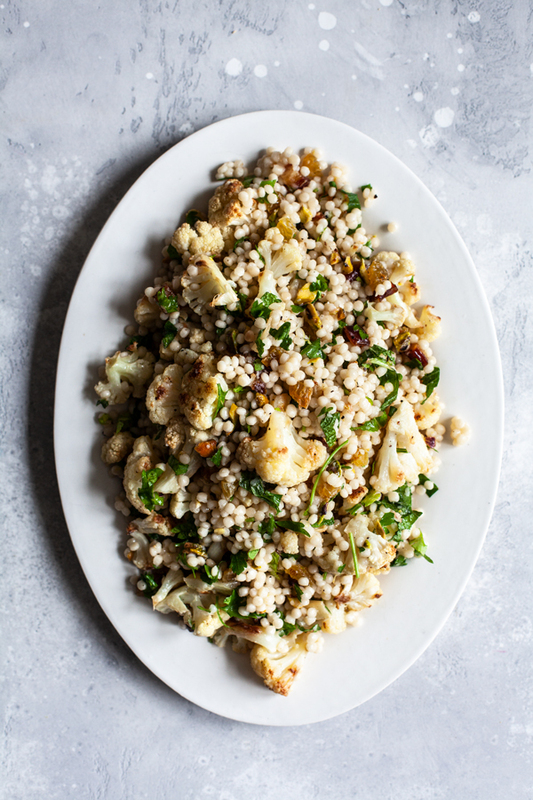 My favorite part of it all, though, are the little jewels of chopped medjool date and golden raisins, which give the salad an irresistable sweetness in spite of its being a basically savory dish of food. The dried fruits and nuts here are thanks to the folks at Sunnyland Farms, who reached out to me and asked if I might be interested in incorporating some of their products into a recipe this spring. Sunnyland is a family-owned and operated farm and mail order catalog in Georgia, which sells nuts, fruits, cakes, and candies. Pecans are the locally grown specialty, but Sunnyland also sells pistachios, cashews, almonds, dates, coffee, and more—as well as nut butters and pecan meal for baking. I requested some of my favorites to try from Sunnyland’s catalog: pistachios, walnuts, medjool dates, and golden raisins. 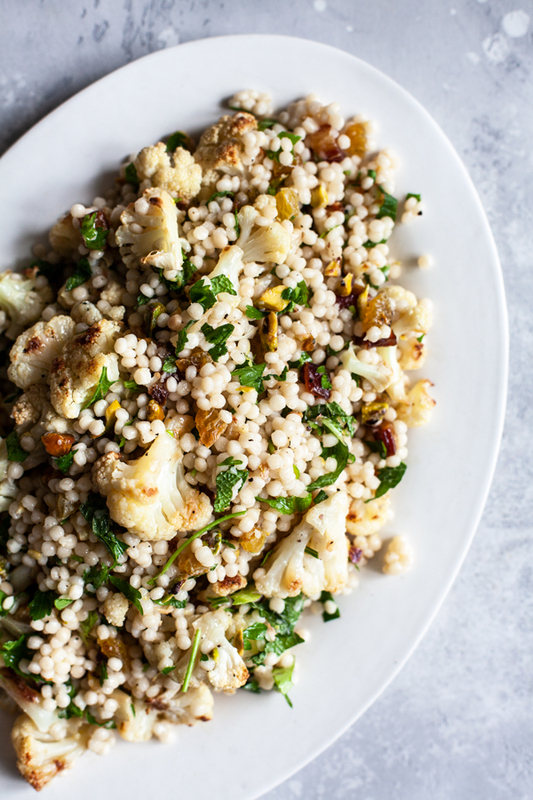 Originally I was only planning to use dates in the couscous salad, but when the raisins arrived—triple the size of what I’m used to and absolutely gorgeous—I knew I had to throw some of them into the mix, too. I like how their more tart sweetness balances the candy sweetness of the dates (which were also plump and beautiful). Meanwhile, the pistachios add a kick of saltiness and crunch. I kept other seasonings simple here: a splash each of red wine vinegar and lemon juice for acidity, and I zested the lemon, too, which brightened everything up. The herbs are also key, not just for freshness but also a little bit of green color. Like most grain or pasta salads, this one can be seasoned to taste as you go along. Throw everything together, try it, then add whatever’s needed—for me, this was a drizzle of olive oil, extra salt, and a little more vinegar. If you like, you can add chives, cilantro, or even chopped arugula in place of the herbs I chose. Preheat the oven to 400F and line a baking sheet or two with parchment paper. Toss the cauliflower pieces with the oil and transfer it to the baking sheet(s). Sprinkle with salt and pepper. Roast for 35-40 minutes, or until the cauliflower is golden and crisp at the edges, and tender all the way through. Remove the cauliflower from the oven and allow it to cool for ten minutes. Meanwhile, cook the couscous according to package instructions. 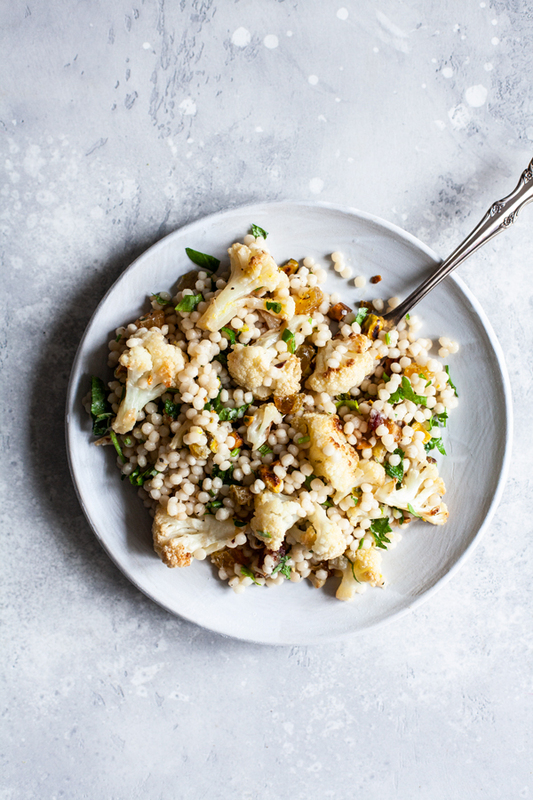 When the cauliflower is finished roasting and cooling, add it to a large mixing bowl, along with the couscous, dates, raisins, pistachios, mint, parsley, lemon zest and juice, and vinegar. Mix everything well. Add a drizzle of olive oil as needed (I used about a tablespoon and a half), as well as additional salt and pepper to taste. Serve while the ingredients are still warm. Leftovers will keep in an airtight container in the fridge for up to 3 days. 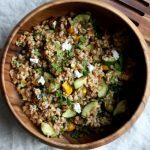 I can imagine making this salad year round, pairing it with baked tofu or adding lentils or when I need a more filling meal, or with veggies or a cup of soup for an easy lunch. 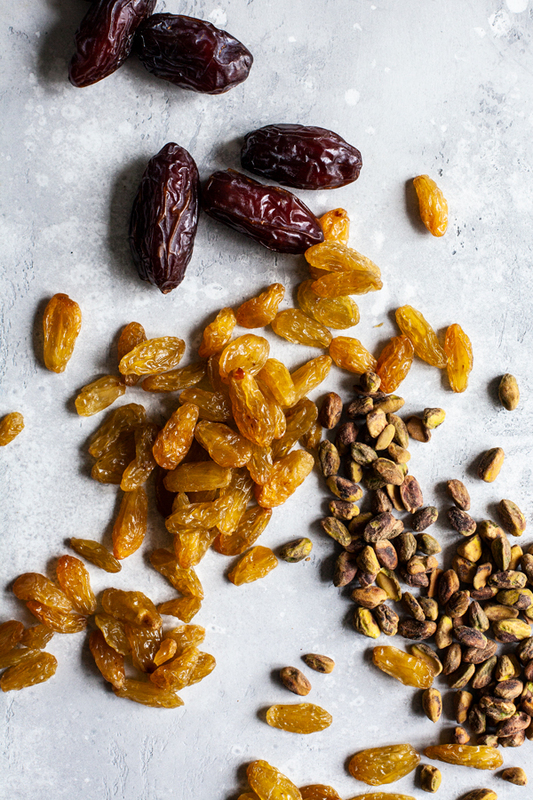 It’s reminding me of how much nuts and dried fruits can add to simple pilafs like this one—and also that I don’t have to reserve dates, which are probably my favorite dried fruit, for oatmeal or baked goods. They’re intense, but a small amount works so nicely in savory dishes, too. If cauliflower’s not your favorite vegetable—or if you’d like to use something more summery here—zucchini and summer squash would work beautifully. I think adding roasted carrots would be a nice touch, too. No matter what, if you try it, I hope you’ll enjoy it. This short week is flying by already, thanks to Monday’s holiday. Wishing you all a happy Hump Day, and I’ll be back soon for the weekend roundup! This post is sponsored by Sunnyland Farms. All opinions are my own, and I love these flavorful nuts and dried fruit. Thanks for your support! So lovely! I don’t eat grains but this will still be beautiful without them! And love the suggestion for in-season subs too! Thank you, Gena! YUM YUM YUM! I love all the different flavors and textures you put together here. Thanks for sharing! This salad is AWESOME! Made for a light summer weekend dinner. I had been wanting to try it ever since you posted it and I’m glad I did. Great flavors!